A huge topic in research is the understanding of cancer, its molecular mechanisms, and the development of anticancer agents and treatments. One important factor regarding the heaviness of carcinosis is the distribution of tumor cells. The mechanisms behind cell migration out of a tumor and how the surrounding tissue influences metastasis have to be studied. There have been several studies using 2-photon microscopes, like the TriM Scope II, to study metastasis on a cellular and molecular level in a mouse model. In combination with the TriM Scope II, LaVision BioTec’s FLIM detector can be used. For example, this enables the study of the activation of GTPase during a mutant driven invasion of pancreatic cancer cells. The fluorescence lifetime is a unique characteristic of a fluorophore. Because it varies with changes in the local environment of the fluorophore, it can be used in Fluorescence Lifetime Imaging Microscopy (FLIM) to observe changes in the local environment that cannot be observed with standard fluorescence microscopy. These kinds of measurements may be made using LaVision BioTec’s FLIM detector as an add-on for the TriM Scope II. In cancer research, FLIM and FRET (Fluorescence (Förster) Resonance Energy Transfer) allows to observe metastatic processes in a physiological and functional context. To illustrate this, pancreatic ductal adenocarcinoma cells are grown in mice, which are then anaesthetized and the tumor is surgically exposed for imaging. To observe the activity of a specific GTPase, it can be modified with two fluorescent proteins, one as the donor, and one as the acceptor in a FRET construct. If the GTPase is active, the FRET efficiency will be high as shown by the lower fluorescence lifetime of the donor dye. If the GTPase is inactive, the fluorescence lifetime of the donor dye will be higher. The GTPase activity in individual tumor cells is then observed with FLIM. The response to drug treatment can also be investigated. FLIM can also be used in the field of cancer research to observe the tumor cell invasion in tissue and the uptake of drugs by cells. This means the influence of the drug on cell invasion and cell death can be observed. As an example of such an experiment, tumor cells from a mouse line can be labeled with fluorescent proteins. For example, these can tag the cell nucleus or the cytoplasm. Then cell spheroids with a defined number of tumor cells can be imaged in a 3D collagen lattice before and after incubation with a drug. By FLIM measurements, the different species, drugs, fluorescent proteins and second harmonic signals (SHG) generated by the tissue, can be distinguished by their different fluorescence lifetimes. This allows the study of the influence of drugs on tumor cell invasion and growth; the influences of surrounding tissue on tumor cell behavior; and finally the cell’s death. 2-photon microscopy enables the monitoring of the interactions between cancer cells with the tissue around them, with other cells, and mechanisms behind the interactions. By making measurements in living animals, the influence of cancer cells and the reaction of the body can be directly observed. Moreover, the effect of different drugs and therapies can be investigated. For example, the shape and dynamics of single cells, and the states of their nuclei can be imaged if they are labelled with distinct fluorescent tags. Additionally, the surrounding tissue can be imaged by detecting the second harmonic generation (SHG) or third harmonic generation (THG) signal. Tissue components like collagen create SHG signals; cellular membranes or nerve fibers THG signals. The different fluorescent labels together with the SHG and THG signals can be excited and their emission can be detected using the TriM Scope II for intravital imaging. Figure 1) Collective invasion of B16/F10 melanoma cells into mouse dermis, detected by infrared multiphoton microscopy. Tumor cells expressing E2-Crimson and Histone-2B-GFP are (false-colored) yellow (cytoplasm) and blue (nuclei). Nerve fibers and fat cells are cyan (third harmonic) and collagen bundles and muscle fibers are red (second harmonic), respectively. 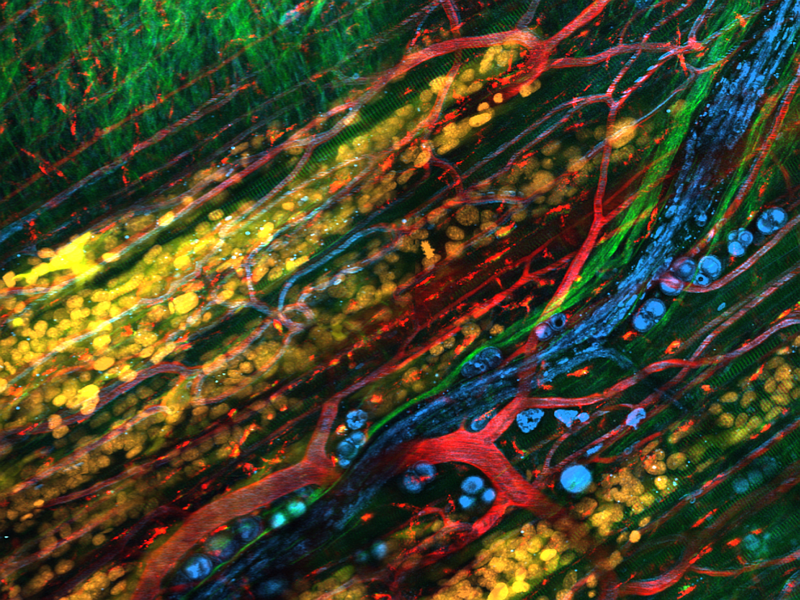 Blood vessels and phagocytic cells are labeled with TM-Rhodamine-dextran in green. By courtesy of Bettina Weigelin and Peter Friedl, NCMLS, Radboud University, Nijimegen, Netherlands. To observe the collective invasion of melanoma cells into the mouse dermis, the nuclei of tumor cells can be labeled with e.g. eGFP. Then, the blood vessels and phagocytic cells have to be labelled with another dye, e.g. Rhodamine, to discriminate the different cells by the fluorescence of their labels. By using two tunable Ti:Sapphire laser lines and by setting their wavelengths at 850 nm and 910 nm, the two different dyes can be excited. To also detect the THG signal of nerve fibers and fat cells as well as the SHG signals of collagen bundles and muscle fibers, a third laser with wavelengths longer than 1050 nm has to be integrated. This is achieved by using an optical parametric oscillator (OPO) that is pumped by a Ti:Sapphire laser or wide band lasers that are tunable between 680 nm and 1300 nm. These lasers also enable the excitation of far-red dyes or fluorescent proteins like E2-Crimson that can be used to label another component of the sample, e.g. the cytoplasm. For excitation, the TriM Scope II offers the possibility to integrate up to two different Ti:Sapphire lasers, an OPO, and wide-band lasers. On the detection side, all the different emissions can be detected with the Spectral Detector placed in backward direction. Because the detection efficiency for SHG signals is higher in the forward direction, a transmission port can be used, too. This means that all the different signals, SHG, THG, E2-Crimson, eGFP, and Rhodamine can be detected at the same time. Figure 1 shows an example measurement provided by Bettina Weigelin and Peter Friedl, Nijmegen Centre for Molecular Life Science at the Radboud University in the Netherlands. By performing time-lapse experiments, long-term dynamics such as the growth, invasion, metastasis, and dormancy of cancer cells can be imaged. It should be taken into account that for in vivo measurements, tissue has to be removed or organs have to be surgically exposed to get access to the region of interest.